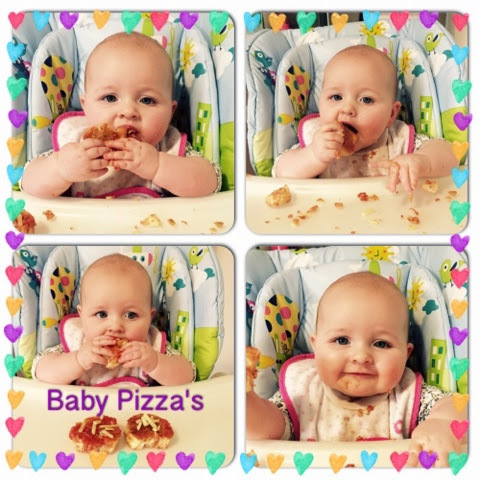 Baby Pebbles: BLW: My Lunch Thursday! Baby Pizzas. On days like today when I desperately needed to go to the shop to do some food shopping the weather was utterly disgusting.. And I'll be damned if I was going out in it. Instead I decided that there must be something I can rustle up for us to eat! The conclusion was toast with chopped tomatoes and cheese! I'd never personally tried this before but in the end I loved it and so did Penny. Someone mentioned to me that they look like mini pizzas! And that's just what they are baby pizza's. They are perfect for blw. All I did was soak the toasted bread in the (heated) tomatoes for a little bit add some cheese and voila! It's super easy for them enjoy and so easy to make.